Practically all the authority in the Heavenly Demon Church belonged to the Pope. Naturally, that meant the Pope possessed quite a bit of power within the church. Not surprisingly, he, the Pope, had up to four military divisions of the church under him. There was the Mara’s Heavenly Wind Division (魔羅天風隊), the Pope’s bodyguards. The Guardians, who were few in number, but boasted the most power in the entirety of the church. The Disciplinary Division, who were the ones to maintain order within the church. And lastly, there was the Ruling Fire House (異火宮). The captivating woman wearing a red dress. She had a skin white as snow, with lips that matched the white skin. Adding to that, her light purple hair gave the woman a mystical aura. She was Baek So Chun (白素天), the current master of the Ruling Fire House, and the one who was known as Flame Witch in the martial world. Her external appearance suggested that she was in her late twenties, but in reality, this woman was well over forty years old. How could this woman display such effects, when she hadn’t even entered the Harmonious stage? The reason was because of two things: her innate strength, and the special magic unique to the Ruling Fire House was what gave Baek So Chun her youthful appearance. This was why this woman was able to stay young after so many years. Rin couldn’t say anything. Not only did she lose the young lady, she had to go all the way to the Grass Shoe Garden without even getting a proper invitation. The Ruling Fire House really lost face because of what happened this time. Even if this event didn’t seem too significant to outsiders, to the members of the Ruling Fire House, who were secluded by nature, this was something very serious. They were one of the ten military divisions within the church, and the only one out of all of them to be solely consist of women. Rin, when she heard Baek So Chun’s question, drooped her head. The young lady was the precious daughter of the Pope. The young lady was brought up in a protected environment because of that. But perhaps that only became a problem for the young lady. After all, the young lady saw the world in too positive of a light. She didn’t realize how dangerous the outside world was, nor did she realize how violent men could become at times. Baek So Chun stopped talking for a bit, then looked over at Gongson Ahri, who was kneeling on the ground right outside, begging for forgiveness. Rin let out a sigh of relief in her heart. At least they managed to control the whole situation just in time… if the situation got out of hand, something bad definitely would’ve happened. Being let off with just this seemed like a gift from the heavens. When Baek So Chun waved her hand, the women in the area grabbed hold of Rin and Ryung, and took them outside. When Gongson Ahri tried to follow them, Baek So Chun stepped in front and stopped her. When Gongson Ahri nervously replied back, Baek So Chun smirked, and rubbed Gongson Ahri’s cheeks. Gongson Ahri made a dark face whilst looking at Rin and Ryung get dragged away. Baek So Chun, amused by the girl’s expression, whispered some words to Gongson Ahri. Gongson Ahri’s eyes began to tremble. While Baek So Chun looked down at the poor scared girl with indescribable joy, Gongson Ahri made up her mind and spoke. Gongson Ahri looked at Baek So Chun with a scared face, and opened her mouth. Baek So Chun toyed with that idea for a bit. No, she pretended to. Indeed, the cause of all this lie in Gongson Ahri. Because of that, Gongson Ahri would technically have to be punished. Baek So Chun smiled bitterly in her mind. If she did indeed punish Gongson Ahri by whipping, it would be hard for her to escape the Pope’s wrath. Even if the Pope was usually very easygoing and relaxed, when it came to his daughter, he was far from that. Baek So Chun knew that better than anyone. It was a question that really hit the spot for Baek So Chun. But trying to deny that outright won’t really educate the girl properly. Baek So Chun shook her head coldly without even flinching when hearing the question. When Gongson Ahri made a face filled with despair, Baek So Chun waved her hand. From a while back, Gongson Ahri had been desperately moving bandages and medicine everywhere, trying to help patch up Rin and Ryung’s buttocks which had been blasted to smithereens by the whips. Gongson Ahri, when she heard that, nodded and muttered under her breath without realizing it. Gongson Ahri, who was kind of spaced out while rubbing medicine on the wounds of the two girls, became surprised upon hearing that, and panicked a bit. When Ryung saw Gongson Ahri rub Rin’s buttocks whilst apologizing to it, she shouted out to the girl. Gongson Ahri quickly walked over to Ryung’s bed, and began apologizing while rubbing the wound with medicine. Rin looked at the girl rubbing medicine on Ryung’s buttcheecks, and smiled. Actually, such an amount of pain was nothing to Rin or Ryung. It should be the first time for Gongson Ahri to see something so bloody, but it was different for Rin or Ryung. To them, this punishment really was light. The martial world was not kind to women. It was a place where one had to do anything in order to survive. If you thought about that, the martial world was actually a pretty good place for both men and women. After all, it was a place where strength was key. Rin felt her buttocks begin to heat up, and slowly closed her eyes. When she did so, she could see something. She could see the cold gaze of the Administrator from the morning. The boy was called Cho Ryu Hyang, if she remembered correctly. To Rin’s eyes, the boy simply looked like a harmless ball of fur who lived a sheltered life. The boy had a face that really didn’t suit the dangerous world she lived in. But that boy would soon become strong. Terrifyingly so. That’s what made her curious. Where did he come from? That boy didn’t look like he was from the Heavenly Demon Church. Rin was getting curious of the heir’s origins. There were many Delivery Companies (標局) who set up their headquarters in the Sichuan castle. Out of all of them, there was a specific company that Cho Ryu Hyang was related to. Gray Sky Delivery Company (蒼天標局). Cho Ryu Hyang was the heir of this company. And in the present, this company was facing a huge crisis. Official Xu (許), the one who managed domestic and international affairs of the company, sweat profusely out of nervousness and spoke. The head of the Gray Heaven Delivery Company, Cho Mu Ryung (草務令), slammed the table and stood up. When someone came at them so forcefully like this, there really was no need to treat them kindly. Cho Mu Ryung, who was about to stomp away in frustration, looked at Official Xu and frowned. The opponent? Cho Mu Ryung’s eyebrows bunched together upon hearing that. When working in a business like this, one frequently comes across martial artists. Eventually, one gets a sense of what the martial world is like, and becomes able to tell who is dangerous and who isn’t. Official Xu was known to be more knowledgeable than anyone else in the Sichuan castle when it came to the martial world. If even a man like this was acting as such, there really must’ve been something special about the person who came today. Official Xu trembled a bit, and opened his mouth carefully. Official Xu lowered his body and whispered. Come to think of it, he did hear that the Black Moon Guild possessed a girl who was smarter than others by many times. The granddaughter of the Night Emperor, Neng Mu Gi. Cho Mu Ryung nodded. Even if he was facing a girl here, he couldn’t underestimate her. She had the Black Moon Guild at her back, along with Neng Mu Gi, one of the three sovereigns. The Black Moon Guild was already quite scary, but Neng Mu Gi was even scarier. After all, Neng Mu Gi was a god of death who listened to no one. Cho Mu Ryung calmed himself, and thanked Official Xu. If he greeted the girl in a frenzied state, something bad could have happened. Cho Mu Ryung nodded at Official Xu, and slowly entered the guest room. Inside, there was a red-haired girl in black clothes. Seeing the girl politely greet him, Cho Mu Ryung introduced himself with a serious face. When Cho Mu Ryung offered a seat, Neng Ha Young comfortably sat down and spoke. How should he respond? Having a person from the Black Moon Guild here for a long time was not a good thing. Even though the Alliance’s power shrunk a bit after the battle with the Heavenly Demon Church, the region of Sichuan was still under the Alliance’s jurisdiction. Neither the Black Moon Guild nor the Heavenly Demon Church could move freely in this area. When Cho Mu Ryung made a troubled face instead of answering, Neng Ha Young opened her mouth. Neng Ha Young nodded. As much as Cho Mu Ryung found this whole situation uncomfortable, she didn’t find this particularly comforting either. But she had something to ask him directly. Somebody was blocking their information network. Because of that, she couldn’t get the information she wanted about Cho Ryu Hyang. So she just made up her mind and came all the way here. Honestly, she had an idea of who it was that was interfering the information network. But finding it out wouldn’t really do her any good, so she was pretending to not know about it. Neng Ha Young thought of the Alliance’s informatics group, and grit her teeth. Neng Ha Young looked around a bit when she heard Cho Mu Ryung’s question. She couldn’t sense anyone nearby. No, she was actually hoping someone would come in. Neng Ha young carefully looked at Cho Mu Ryung, and opened her mouth. Cho Mu Ryung’s face stiffened the moment he heard his son’s name coming from the mouth of Neng Ha Young. He suddenly had an ominous feeling growing in his mind. Cho Mu Ryung desperately tried to control his facial expressions, and looked at Neng Ha Young. Neng Ha Young stared back as she spoke. Wasn’t that the place where the war took place recently? Why was his son all the way over there? Cho Mu Ryung somehow calmed his heart, and began to think carefully. He was a merchant. He always had to have the worst possible situation in his mind, but he didn’t want to do that. Not now. Finally, a question she had been waiting for. Neng Ha Young smiled in her mind, and answered. Cho Mu Ryung’s face paled. The worst scenario in his mind had actually come to life. 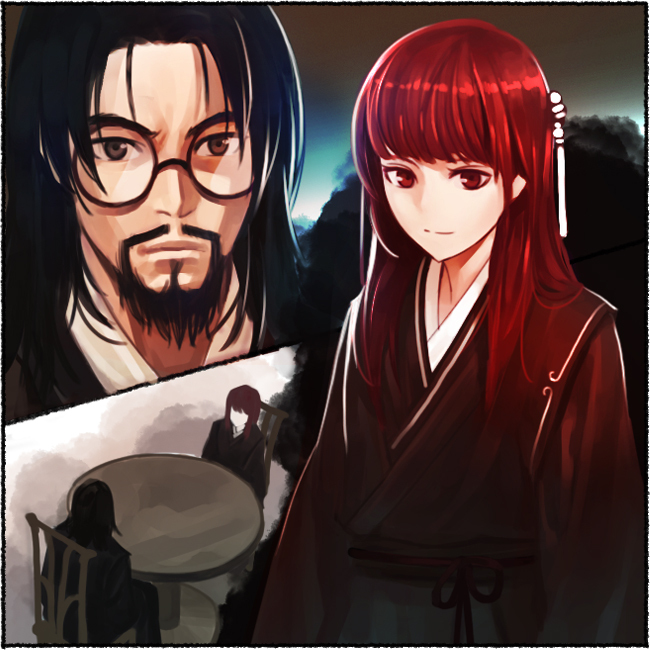 Uh…yeah, i just realised…have they not informed cho ryu hyang’s family about his new status??! I mean, that should be an important thing, right?! But i guess, cho ryu hyang was also not thinking about it, because of the death of teacher…but still, still…!! I am not going to answer that question. I am tempted, but no. Answering this will probably piss people off. Thanks for the chapters! I’ve missed this series. very good story, I hope you can release a Chap daily, but that’s too greedy of me. Thanks for translating this awesome story. Thank you so much for all your hard work!!! Super love this one!!! I am looking down the cliff hoping for answers … the pain is real this chapter. btw when is the next chapter coming..
Oh my, aren’t you greedy… it’s only been two days since I released a double chapter… It should be out in either one or two days. Thanks for the update. I just want to ask, how frequent do you update the novel? It’s getting interesting so far. once to three times a week. Three if I feel healthy, two if I feel normal, one if I feel dead.